DuraCel RM has metal cell sides with spot welded face guards and a flange header on the air entering and air leaving sides. The media pack is folded between aluminium separators in a pleated design. The edges of the separators are longer than the inside folds of the media. This construction prevents the separators from moving and puncturing the media. 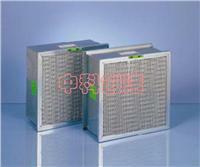 The filter media is a finely woven glass mat which is capable of operating temperatures up to 150°C . Two versions are available:RM-60 and RM-90.The filtering efficiency of the RM-90 is in excess of 99% by the weight test method.The filtering efficiency of the RM-60 is 98% by the weight test method.